Denmark is the southernmost of the Scandinavian nations and is bordered by the Baltic Sea and the North Sea. Danish history may have begun during the Paleolithic/Neolithic Period as a nomadic hunter-gatherer society. Later on, during the 9th and 10th centuries, Denmark was home to the Vikings. Vikings were master seafarers who raided and pillaged Europe. They also traveled great distances to the Mediterranean, the Arab world, England and beyond. Danish actor Mads Mikkelsen at the 2013 Cannes Film Festival. By Olivier Strecker. The Denmark population data represent DNA samples from 200 randomly selected individuals from Denmark. STR frequencies were reported in the most recent European database release of the Working Group of the European Network of Forensic Institutes STRbase Project (frequencies). On the left is a photo of the Tollund Man. 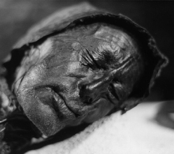 The Tollund Man was discovered in Tollund, Denmark in 1950. The peat bog, which he was found in, naturally mummified him. The acid in the peat preserved the tissue of his body. C14 dating puts his date of death between 375-210 BCE, during the early Iron Age. He is on display in the Silkeborg Museum in Silkeborg, Denmark (Tollund_Man).